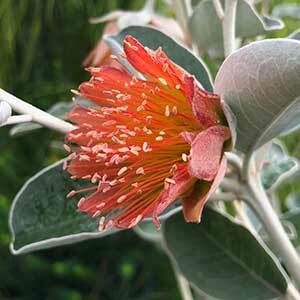 Diplolaena grandiflora is native to Western Australia and grafted forms are readily available for sale, these forms are probably best for growing outside of its native habitat. Also known as the Native rose, Wild rose or Western rose, Diplolaena grandiflora makes an excellent specimen plant either in the garden or in a container. Requiring a well drained soil and plenty of sun eventually it will grow from 1 -3m high with a similar spread depending on conditions. Grown for its showy nodding red flowers which appear from autumn through to spring. Foliage is dark green with a downy or hairy texture on the underside. Growing conditions and plant care. These are not a difficult plant to grow given a few basic requirements. All Diplolaena require a well drained position with sun to semi shade, they prefer a climate that does not experience humid conditions as this encourages fungal disease. A native plant fertilizer in early spring (low phosphorous) will improve growth. A light mulch around the base of the plant will help maintain a cool root run and also suppress weeds. Grafted forms or Diplolaena are now becoming available, generally smaller growing and more compact in habit, these perform much more satisfactorily in the home garden. Some good example can be found in gardens around Melbourne, so they can grow well outside of their natural range. Although heavy pruning is not recommended, tip pruning just after flowering will help maintain a bushy compact habit.